Very different from the normal Trump. 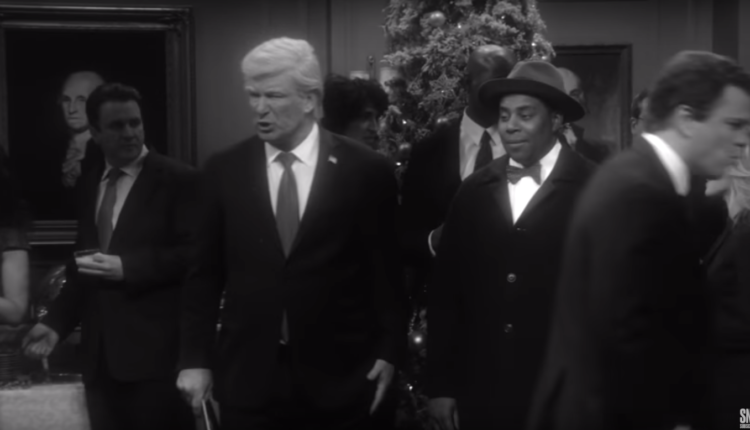 Saturday Night Live has made annoying the president its greatest focus. More than developing any cast member or writer on the show, more than crafting new characters that franchises and kingdoms can be built around. No, the #1 concern of Saturday Night Live is one thing — annoying the president with an in and out of the newspaper for some dumb bs,Alec Baldwin, in tow. And I guess this one really, really got to him, since after watching the “It’s a Wonderful Trump” sketch, the president then went and Tweeted calling for the illegilization of Saturday Night Live and satire in general! And what is “It’s A Wonderful Trump”? Well… it imagines a world where Donald Trump was not elected president and– in a parody of “It’s A Wonderful Life” — the world without a president Trump is infinitely better. Trump, feeling the walls of the Mueller investigation closing in on him, as he seemingly does in life, is visited by Clarence the Angel, as played by Kenan Thompson. Kenan then shows him the world without him, and everyone is infinitely happier, including him. Mike Pence is a cool as heck DJ, Sarah Huckabee Sanders works some crappy job for Ashley Madison, the dating service for cheaters, Eric Trump can solve Rubik’s Cubes and Melania Trump lost her accent. Trump himself is married to a foreign Deal or No Deal briefcase girl, played by Heidi Gardner, and Ben Stiller comes in as a non imprisoned Michael Cohen who tells Trump he taught him everything he knows! Get it, because he betrayed the guy. Ah, they get it. Matt Damon and Robert DeNiro as Brett Kavanaugh and Robert Mueller. What did you think of the sketch in question? Do you wish SNL would let someone else play the president so a cast member can actually stand out on the show? Let us know in the comments or on Twitter at @WhatsTrending.